During these hours, there are librarians there so you can check out DVD's or any of the newer books within the locked cabinets which must be checked out. Any of the other paperbacks, books on open shelves, magazines, puzzles may be taken out and returned with no assistance at any time the clubhouse is open. Our library is one of the friendliest places around. People are always dropping by to pick up books and DVDs. We have a great collection, both purchased and donated. 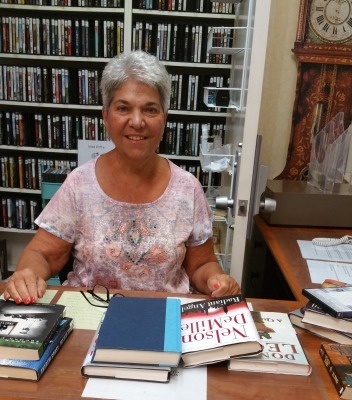 The volunteer staff of librarians are knowledgeable, friendly and helpful. Come in during business hours to check out books and DVDs or any time to grab some excellent reading materials from our organized shelves. The Library is also a center for the Knit-Wits, the group that crochets and knits hats and blankets for cancer patients.